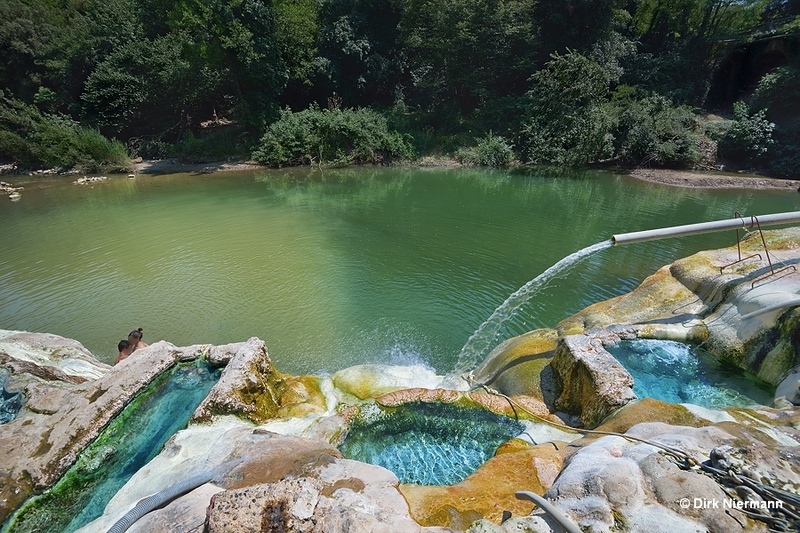 The hot spring of Petriolo really shines by its rich cultural history. 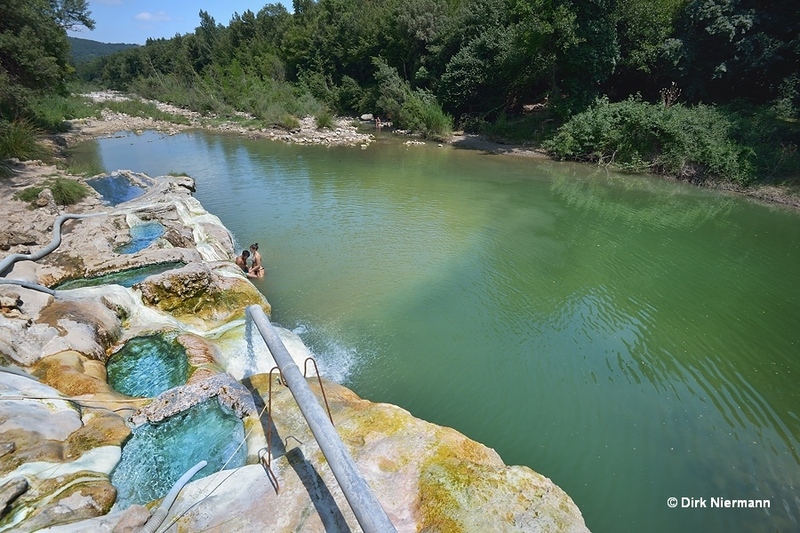 Located 65 km (40 miles) south of Florence in the Ombrone Valley of Upper Maremma, it offered bathing fun already to people in Etruscan and Roman times. Moreover, the famous Roman consul Cicero mentioned the thermal bath in one of his orations. Even later, soaking in the natural travertine pools on the bank of the river Farma continued to be very popular, so they were well maintained and also artificially modified. In 1292 a bathhouse with three basins was built, which were fed from the outside by the hot spring. Especially the rich and powerful such as the Medici, the Lords of Florence, or Pope Pious II frequented the baths. This ancient spa was so valuable to the people that they protected the whole area in 1404 with a high wall and towers against attacks by bandits. 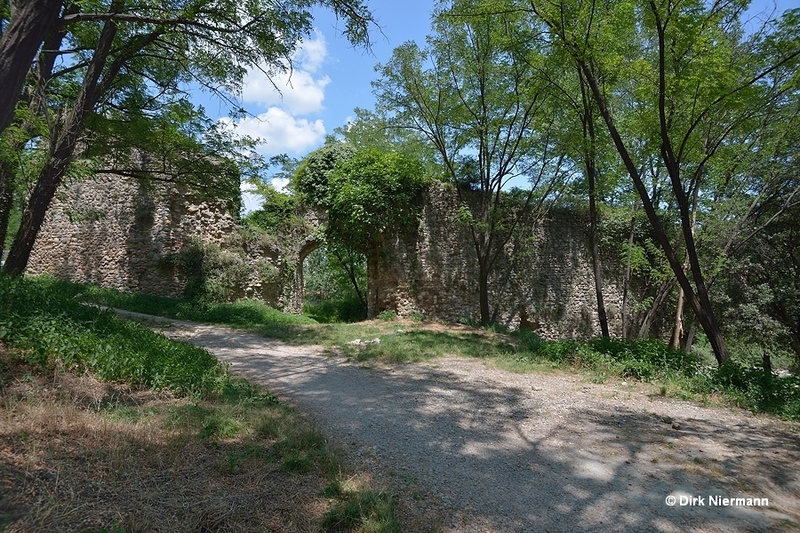 The ruins of the bathhouse and remains of the wall in the typical Sienese architectural style can still be seen today. In contrast, the natural hot spring on the river bank has been hidden away by forcing it into an aesthetically questionable corset of concrete, pipes, and valves. Some of those pipes replace the former widespread natural runoff channel from the spring to the travertine pools. Located several feet away from the river Farma, the spring yields approximately 40 liters per second (634 US gpm) at varying temperatures between 42 and 45 °C (107 - 113 °F). Origin of the water is the slope of the volcano Monte Amiata at a distance of 35 km (22 miles). Besides dissolved salts, mostly carbonates, the water also contains hydrogen sulfide and emits the characteristic smell of rotten eggs. Most of the thermal water is channeled off to feed two spa termes in the surroundings, and only a minor share is still permitted to fill the natural basins on location. 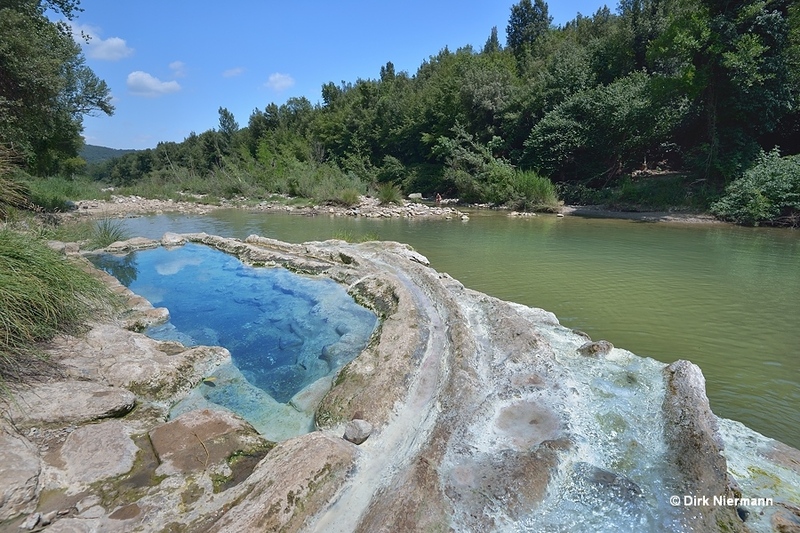 Five travertine pools are part of the setting on the river bank, each of which with a different color and a slightly different water temperature. The one closest to the spring is called Pozzo dell'Inferno (Hell's Well). It holds the hottest water at nearly the same temperatures than the spring. On the northeast side its runoff cascades down into La Conchiglia (The Shell), where it stays at approximately 40 °C (104 °F). Next in the line is La Bara (The Coffin), also called La Tomba (The Tomb). Reason for its morbid name is no horrible event, but probably its elongated shape, featuring just the appropriate dimensions. A slightly lesser water temperature is to be found in Il Fagiolo (The Bean), bearing a self-explaining name. There are several pipes to feed the pools, and the strongest afflux even carries an own name: La Troscia (The Spurt). Sometimes its water jet is directed towards the travertine slope, and sometimes it drains directly into the river Farma. The largest basin is a little bit separated from the other pools, and different names are in use for it: Vascone (Tub), Vasca Grande (Large Pool), or Fossa (Ditch). The temperature ranges between 30 and 35 °C (86 - 95 °F). On the riverbed, below the runoff from La Troscia and the pools, basins have been fenced off by small stone walls, where thermal water and cold water blend. They are only visible and in use at low water level. All in all, currently the place conveys more the impression of an abandoned construction area than of a jewel of nature. The pictures are telling only the better half of the story because of an appropriately selected camera perspective on a day with only a few visitors. By the way, the times when Bagni di Petriolo was an insiders' tip are long gone, so in summer it is usually quite crowded with bathers.